The following article gives an insight into temples in Nepal and the visiting of temples by Hindus and Buddhists alike. 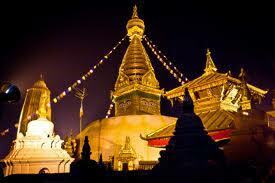 Religiously, Nepal is formerly a Hindu country and as such there are many Hindu temples to see. However, the minority of citizens who are not Hindu are primarily Buddhists. Buddhist temples (gompas) in Nepal are slightly less formal than the Hindu temples. It is important that if you visit a temple during your visit in Nepal that you familiarise yourself with temple etiquette prior to entering. This is essential if you are to avoid offence and make the most of your visit. You should always ask permission prior to entering a temple in Nepal and you will often find that there is a caretaker on hand. The caretaker is the best person to ask if possible. There are some temples in Nepal which prohibit entry to non Hindus / Buddhists however and hence, requesting entry to the temple will be to no avail. Please note that you are also likely to be prohibited entry to a Hindu temple if you are wearing leather. This includes leather shoes. The majority of temples in Nepal require those entering to remove their shoes. Facilities are left outside the temple for you to leave your shoes. If you are entering a gompa temple then it is recommended that you also remove your hat. 5) Be extremely quiet whilst you in the temple and respect the fact that individuals can be distracted by your presence. The presence of tourists in temples in Nepal is becoming problematic in some areas due to the disruption caused by the traffic of non devotees into and out of the temple. For this reason, consideration is being given to secluding particular parts of the temple from tourists. If you meet the head lama (teacher / priest) when you are inside the Buddhist temple in Nepal it is traditional to present him with a white scarf wrapped around a donation. White ceremonial scarf is known as a ‘kata’ and it can be obtained from another monk. The lama will then either remove the donation and return the scarf to you or take both the scarf and the donation. If the lama returns the scarf to you then he is likely to place it around your neck. It is believed that in doing so, the scarf will act as a blessing for you. It is also recommended that you leave a donation when leaving Hindu temples too.